---Our bands are made of highest quality 100% genuine eco-friendly latex (not rubber bands which are much cheaper and tend to break easily). They are stronger and able to stretch further. You will feel the same resistance after a dozen reps.
---Five color-coded professional gym quality natural latex tube bands can be used alone or stacked in any combination up to a maximum equivalent of 100 lbs. ---Whether you're just starting to incorporate fitness bands into your cross-training routine or are looking to add a few new bands into your current collection, Gudui resistance bands set offer the versatility and quality that you need for your best workout. These bands are ideal for a wide variety of fitness-related uses, including physical therapy, weight loss, Pilates, muscle toning, muscle strengthening, stretching, rehabilitation and general health and fitness. The bands are compact and portable, so you can take your workout anywhere. Available in a wide variety of resistance intensities, so you can take control of your workout. ---These bands are rigorously tested to be snap, stretch and sweat resistant. ---You get 5 resistance bands set and you can stack multiple bands to find your ideal resistance. ---These bands are so lightweight that they make a great travel fitness kit! ---This is also a great Christmas, Mother's and Father's day gift idea for men, women, dad or mom. ---Please take care of your safety while in using, if necessary, please search online for instruction videos about how to effectively use the resistance bands. 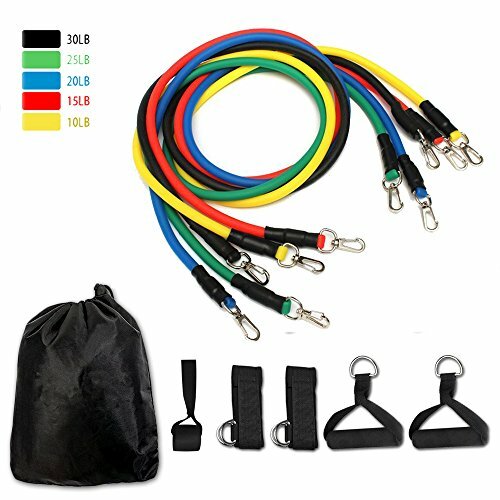 11pc ATHLETIC SERIES RESISTANCE TUBE SET: Includes: 5x Metal-Clip Resistance Bands: Yellow 10 Ibs. red 15 lbs. Blue 20 lbs. green 25 Ibs. and Black 30 lbs. . All Bands Are 48 Inches In Length. PRO ACCESSORIES: 2x Cushioned Soft-Grip Handles 1x Door-Safe Anchor 2x Soft Ankle Straps 1x Tribe Carrying Bag. Great On-the-Go: Compact and travel-friendly size make portability a breeze to and from the gym. Made of Eco-friendly natural latex for maximum strength. Each band comes with soft Grip Handles, Door Anchor, Starter Guide and Carrying Case. APPLICABLE FOR EVERY FITNESS LEVEL - Whether you're a beginner or an expert, these resistance bands are for you. The variety of resistances and multi clip system means you can adjust the intensity of your resistance-band workouts to suit your personal goals. 100% MONEY BACK GUARANTEE - Gudui stands behind all our products 100%, please feel free to contact us for replacement or refunds if there are any issues with your purchase. If you have any questions about this product by Gudui, contact us by completing and submitting the form below. If you are looking for a specif part number, please include it with your message.